The Razer Blade Stealth has an optional dock that transforms it from an ultraportable laptop to a gaming monster. If you're a gamer, you don't have it easy when buying laptops: You may want a sleek, lightweight Ultrabook when you're traveling, but you also want the big, powerful desktop replacement when you're home. What to do? Razer thinks you can have both. It's launching the Blade Stealth, a 12.5-inch ultraportable with some proper gaming cred. 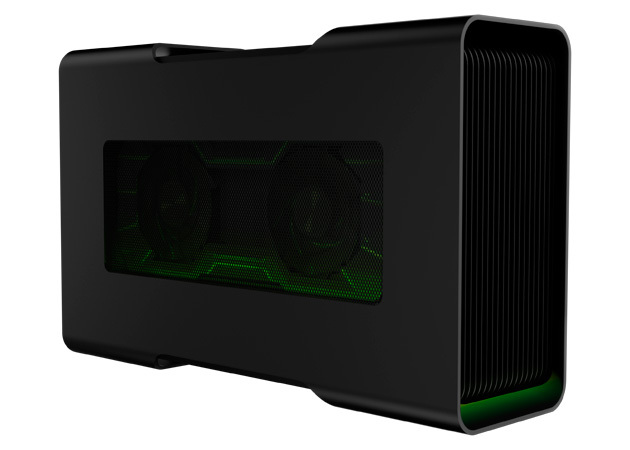 Its centerpiece is an optional Thunderbolt 3–powered dock, the Core (below), which lets you use most any modern desktop graphics card when integrated video won't cut it—if you just have to play Battlefront at max detail with a GeForce GTX 980 Ti, you can. It has Ethernet and four USB 3.0 ports, too, so you only need to plug in one cable to get all your usual peripherals. It's a solid machine, even if you're more interested in Facebook than Far Cry. The base $999 Blade Stealth begins with a dual-core 2.5GHz Core i7, 8GB of RAM, a 128GB solid-state drive and a quad HD (2,560 x 1,440) screen. It's light, at 2.75 pounds, and you'll even see Razer's multi-hued Chroma lighting on the keyboard. Spring for higher-end models (which top out at $1,599) and you'll score up to a 4K display and 512GB of flash storage. The Blade Stealth ships this month, and you can get it at Microsoft Stores in February if you need to see it in person. However, the Core doesn't have either a ship date or a price. That makes it a real wildcard: If it's expensive or takes forever to ship, the combo won't be quite so alluring. Nonetheless, this may be your best shot at a best-of-both-worlds laptop.